Box Text: Conceived and designed by Steve Cartwright for one daredevil flying ace at a time. Ladies and Gentlemen! Presenting one of the most hair-raising, heart-stopping and breathtaking video games ever to fly across a TV screen: Barnstorming by Activision! You'll be amazed as your small but sturdy biplane, flying inches off the ground, actually zooms through barns, soars over windmills and dodges flocks of pesky geese, and you're at the controls. Don't be afraid. 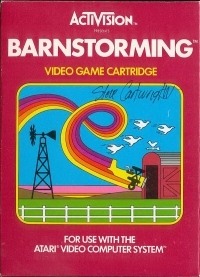 Climb into the cockpit and take off with Barnstorming by Activision. Happy landings! 10-14-2012 exonerator Description Steve Cartwright was inspired to program Barnstorming during his first week at Activision when he was driving home and saw a biplane pulling a banner advertisement. With that image in mind, he created the horizontally scrolling game that came to be called Barnstorming. The game is notable as being the first Activision game with a sunset in the horizon, although it did appear in the Venetian Blinds Demo. At the time, the sunset effect was an impressive feat on the Atari 2600, as it was difficult to map all the colors on the screen at the same time due to the limited memory of the system. The effect was so popular that other programmers reused the code in other Activision games. 02-02-2012 pacpix Box Text Conceived and designed by Steve Cartwright for one daredevil flying ace at a time. Ladies and Gentlemen! 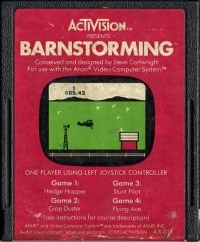 Presenting one of the most hair-raising, heart-stopping and breathtaking video games ever to fly across a TV screen: Barnstorming by Activision! You'll be amazed as your small but sturdy biplane, flying inches off the ground, actually zooms through barns, soars over windmills and dodges flocks of pesky geese, and you're at the controls. Don't be afraid. 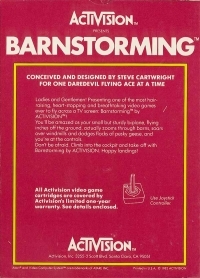 Climb into the cockpit and take off with Barnstorming by Activision. Happy landings! This is a list of VGCollect users who have Barnstorming in their Collection. This is a list of VGCollect users who have Barnstorming in their Sell List. This is a list of VGCollect users who have Barnstorming in their Wish List.